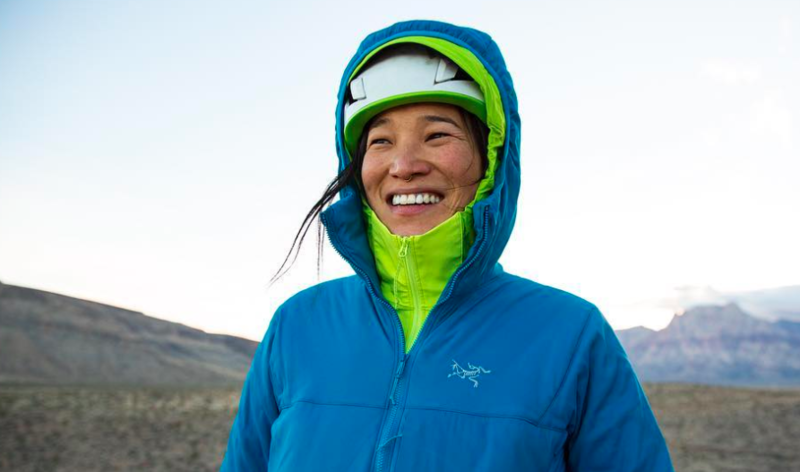 Amer Sports reported a slight decline in earnings in the fourth quarter. Sales grew 10 percent overall on a currency-neutral basis and 5 percent on an organic basis. Growth was strongest in Apparel, up 41 percent and D2C, ahead 23 percent. Regionally, revenues increased 16 percent in China and 10 percent in the U.S. The company’s brands include Salomon, Arc’teryx, Peak Performance, Atomic, Mavic, Suunto, Wilson and Precor. Net sales €874.2 million (October-December 2017: 786.0). In local currencies, net sales +10 percent. Organic growth was 5 percent. EBIT excluding items affecting comparability (IAC) €96.7 million (98.1). Items affecting comparability €-12.9 million (-5.4). Earnings per share excl. IAC €0.53 (0.57). Earnings per share 0.44 (0.44). Free cash flow €187.7 million (156.2). Net sales €2,678.2 million (2017: 2,574.6). In local currencies, net sales +7 percent. Organic growth was 4 percent. EBIT excl. IAC €231.2 million (214.4), 8.6 percent of net sales (8.3). Items affecting comparability €-22.3 million (-44.9). Earnings per share excl. IAC €1.23 (1.18). Earnings per share €1.08 (0.80). 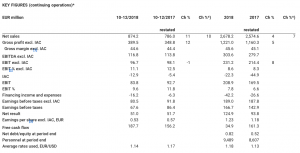 Free cash flow €34.9 million (161.3). Net debt/EBITDA excl. IAC 2.5 (December 31, 2017: 1.6). Due to the terms and conditions of the ongoing tender offer for all the shares in Amer Sports Corporation, the Board of Directors proposes that at this time no dividend shall be distributed to shareholders. 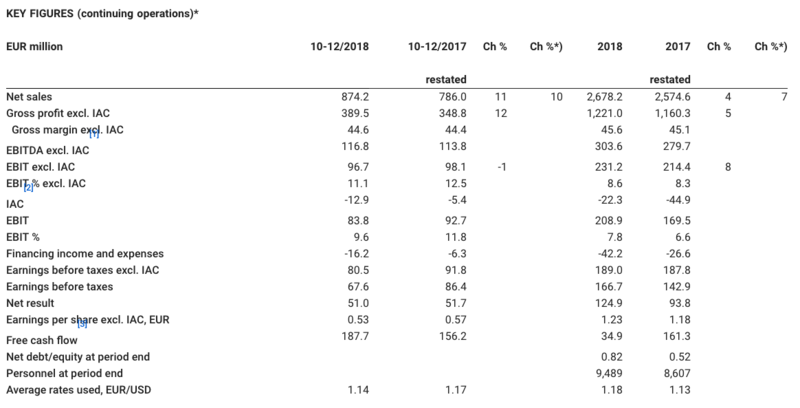 In 2019, Amer Sports’ net sales in local currencies as well as EBIT excl. IAC are expected to increase from 2018. The company will prioritize sustainable, profitable growth, focusing on its strategic priorities in Apparel and Footwear, Direct to Consumer, China, and USA, whilst continuing its consumer-led transformation. “We closed the year 2018 with a solid Q4. Topline was up 10 percent (organic +5 percent), driven by our strategic acceleration priorities and on-going transformation. Growth was strongest in Apparel (+41 percent), boosted by the acquisition of Peak Performance. D2C (+23 percent) and e-tail (+15 percent) were again the winning channels, and China (+16 percent) and USA (+10 percent) drove geographical growth. Fitness (+9 percent) had strong topline momentum but profitability requires further work. In Q4, we continued to prepare strategically for a more focused portfolio as we proceeded the Cycling sale process, and in the core business we continued to invest into future growth to ensure a strong pipeline of initiatives for 2019 and beyond. Amer’s full statement is available HERE.